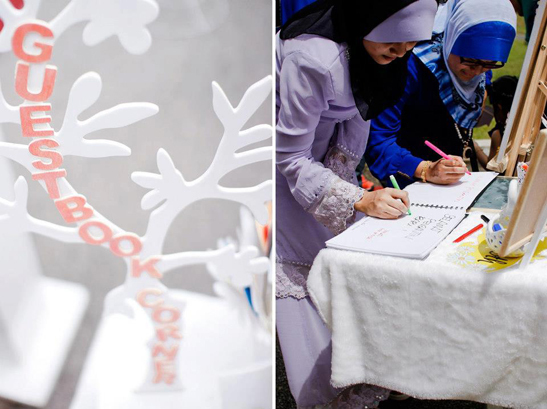 This was our first guestbook corner. Simple, or more likely, too simple. Luckily, there was a space on the dessert table, and the wedding cake was place on that table. So we put whatever we managed on the table we found - fur carpet, vases of photobooth props and colour pens , guestbook and some decorations too. 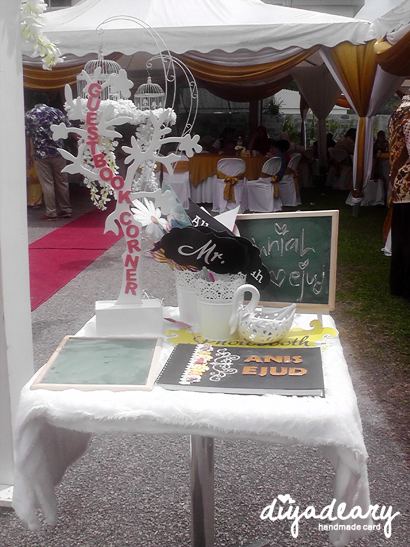 Well, we setup the corner within few minutes as the groom's entourage arrived. Haha. Automatically, Diyadeary mood off, and the bridesmaid duties on. In the end of the day, what matter most was, how this small corner enliven the ceremony, giving thousands memories to the newlywed couple, family and guests. Alhamdulillah. Thank you.... Happy Friday, and have a great weekend!